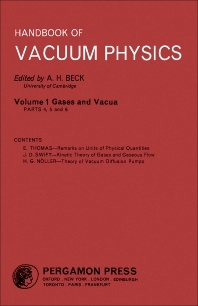 Handbook of Vacuum Physics, Volume 1: Gases and Vacua presents three major topics, which are the fourth to sixth parts of this volume. These topics are the remarks on units of physical quantities; kinetic theory of gases and gaseous flow; and theory of vacuum diffusion pumps. The first topic aims to present concisely the significance of units of physical quantities, catering the need and interest of those who take measurements and make calculations in different fields of vacuum sciences. The technique and applications of this particular topic are also provided. The second main topic focuses specifically on ideal gas equations, the mean free path, the Maxwell-Boltzmann distribution law, and other mathematical equations relevant in the study of kinetic theory of gases and gaseous flow. The last major topic in this text examines the production of vapor, gas dynamics, and high- and fine-vacuum diffusion pumps. This part also provides symbols usually used in vacuum physics. This book will be beneficial to physicists and students of physics interested in the study of vacuum.